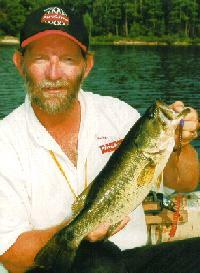 Clear Bay offers a whole gammut of bass fishing opportunities. The lake is studded with islands and shorelines offer plenty of cover in the form of stumps, blowdowns and weedy patches. A good approach to fishing Clear Bay is to “run & gun”, fishing one good looking spot or piece of cover, then moving quickly on to the next. Don’t waste a lot of time straining shorelines here – there is too much good cover for bass to be roaming in non-descript places. Try a casting approach first – spinnerbaits, rattlebaits, crankbaits, twitchbaits – then work the cover again using a slower approach. Soft pLastics always work if you have the patience to fish them slowly, right in the thickest cover. In and around the stumps and blowdowns, flippin’ a jig & pig will produce big bass.